This serious comedy from the team of Frank Launder and Sidney Gilliat is about absentee British landowners in Ireland and their rebellious Irish workers. 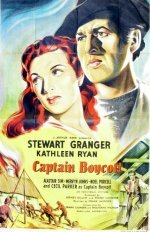 Set in the 1880s, it stars Stewart Granger and Kathleen Ryan, with Cecil Parker as the unpleasant Boycott, whose name accordingly entered the language after a failed attempt to collect the rent by force. Lavishly made, partly on location, it falls uneasily between historical adventure and political lampoon, though the cast plumps for the latter.